The popular Suzuki Vitara SUV has been updated for 2019 - with new engines and revised looks among the key changes. 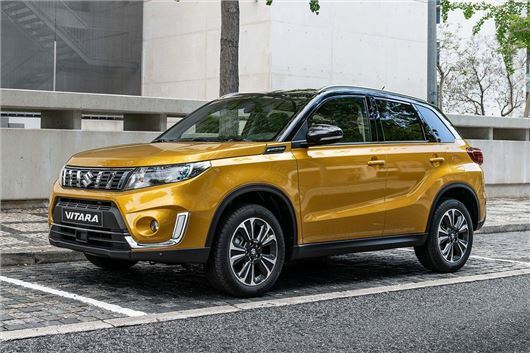 Suzuki's yet to reveal prices for the updated Vitara, but don't expect them to differ much from the current £15,999 start price when orders open in September. The 1.0-litre and 1.4-litre turbocharged Boosterjet petrol engines that made their debut in the S-Cross last year replace the current 1.6-litre petrol in the Vitara range. Although exact fuel consumption and performance figures are yet to be announced, Suzuki says these will combine more power and torque with greater efficiency and lower emissions. SZ4 and SZ-T models are available with the 1.0-litre engine producing 111PS, while the top-spec SZ5 can be ordered with the 1.4-litre Boosterjet engine producing 140PS. Cosmetic updates include a redesigned front grille and lower bumper, while the rear lights have been tweaked. New alloy wheels are available, while two new colours have been added to the range. Inside, there's some extra soft-touch materials for 'added quality', says Suzuki, and the instrument cluster has been redesigned with a colour central information display. There's also extra safety kit now available as standard on the SZ5 model, including lane departure warning, traffic sign recognition and rear cross traffic alert. Well, I own one with 1.6 petrol engine, which is great reliability and efficiency wide. I know that many owners bought this particular one for above reasons, as oppose to 1.4 booster jet. I think this may turn up to be a shoot in own knee for Suzuki. 1.4 Booster Jet engine has been available in top "S" trim for some considerable time...they are dropping it into the SZ5, but no lower trim level for now. Totally in agreement about the non-turbo 1.6 being dropped looking like a bit of a mistake in terms of its current efficiency and long term reliability - shame they couldn't keep it going in at least a lower-spec level. I was tempted by the current model 1.4 Booster-jet S but was a bit put off by the styling mods which look a bit tacky (not keen on the different grill and I always think totally black alloy wheels look like cheap wheel trims). So if that engine comes with the SZ5 spec that's a step in the right direction for me - but as the current SZ5 comes with a standard panoramic sunroof, that's not so good for me in terms of headroom if the new model follows suit. The subtle styling tweaks make the car look a bit more upmarket - hopefully that doesn't mean a huge price hike (thinking about the recent Swift Sport price shock) - and it will be interesting to see what they've done with the 'back to the nineties' interior design (though not a deal breaker when considering the other talents of this car). I agree - it's a shame that the 1.6 engine is dropped. Bought a new Vitara only last week and the 1.6 engine suits it very well - economical, quiet and has adequate power. It will prove a lot more durable and trouble free than those highly stressed, direct injection, turbo charged, little 3 cylinder engines. I have the same 1.6 petrol engine in my earlier SX, it has lack lustre performance particularly pulling from low revs and this has been carried over to the Vitara, I've driven the 1.4 and found it much more flexible and been waiting to see if it would be introduced across more of the range.